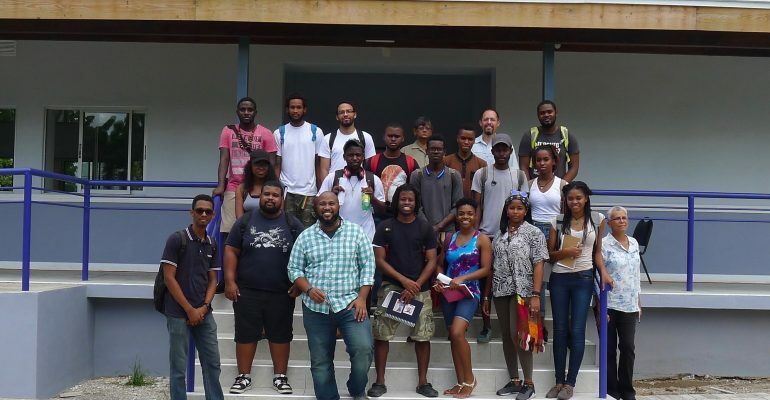 Students from the Caribbean School of Architecture at the University of Technology recently toured the Caribbean’s first net zero energy building at the University of the West Indies, Mona campus. The tour was led by the Project Coordinator of the Net Zero Energy Building (NZEB) Project Mr. Kevin Rodriguez. Students and their lecturers were introduced to the design and construction concepts and principles which were used in the construction of the building. A net zero energy building is a building in which the total amount of energy used on an annual basis is roughly equal to the amount of renewable energy created on the site or at other renewable energy sources. The UWI Net Zero Energy Building will be a prototype for the region constructed as a demonstration of emerging and best practices in the built environment, including energy efficiency, ideal building layout, window detailing, and efficient lighting and cooling. The goal of the project is a modal shift in building forms and technologies, making zero net energy construction the preferred option in tropical and sub-tropical regions.